Description: Silver in color with blue or greenish back. Slender, round body, long drawn snout, overhanging and downward pointing mouth. Darker streak running down the body with faint cross bands following the lateral line and shades of black outlining the fins. Location: Inshore water of the Atlantic Ocean, Gulf of Mexico, and Pacific Oceans. Grass flats or white sand flat, usually in shallow water less than three feet in depth. Common in the Florida Keys. Observation: Seen most common in multiple numbers scavenging the shallow flats in search of a food source. Chances are you have heard about bonefishing, and that Key West is the place to catch them. Bonefish are built for speed. Lightning quick runs work the drag system of the greatest tackle. Challenge your heart and your skill pursuing this great fish. Our local waters produce large bonefish. The waters around Key West provides you the angler with the challenge and diversity to fish “the grey ghost”. Large expanses of white sand flats and turtle grass offer the ideal scenario for sight casting to feeding bonefish. There are no bones about it, they love to inhabit our shallow water flats, and so do we. 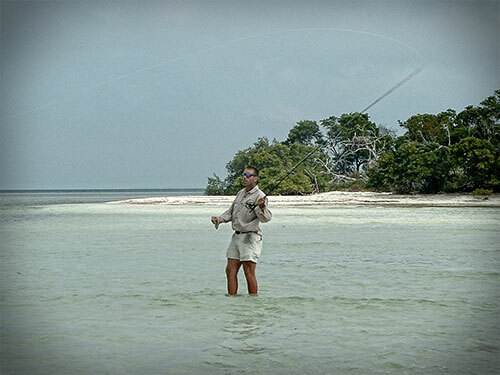 Stalk the flats for the bonefish and make a cast with a live shrimp and watch the excitement unfold. Or, fish with artificial bait and make it happen your way. Let me put you on the fish and you do the catching. Enough reading about bonefishing, come to Key West and get your feet wet. These fish - also known as the Grey Ghost - will make you work. Fast runs, doubling back on you, large arbor reels were designed for these fish. Come check out the large bonefish in Key West. Red-hot bonefishing in the Florida Keys with plenty of action for a fly rod angler of any skill level. Spend time in the skinny water looking for muds or pushes of water chasing the gray ghost. You have to fish the tide for these beauties. Knowing what flat to be on and when to be there is the trick. 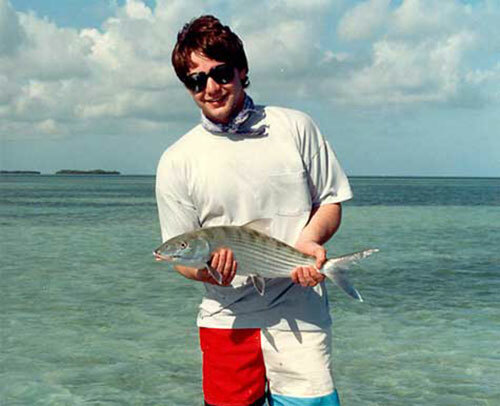 Let me guide you toward your first bonefish or add notches to your belt. You can fish these from my skiff or we can wade the flat if conditions are right. Bonefishing Key West is not a question of if, but when. Number 7 to 9 weight fly rod and complimentary weight reel (large arbor preferred) with lots of backing, fluorocarbon leader system. We use the double haul casting technique and beginners always welcome.